Help your kids mix up a healthy, homemade ranch dressing made with Greek yogurt, fresh herbs, and garlic. 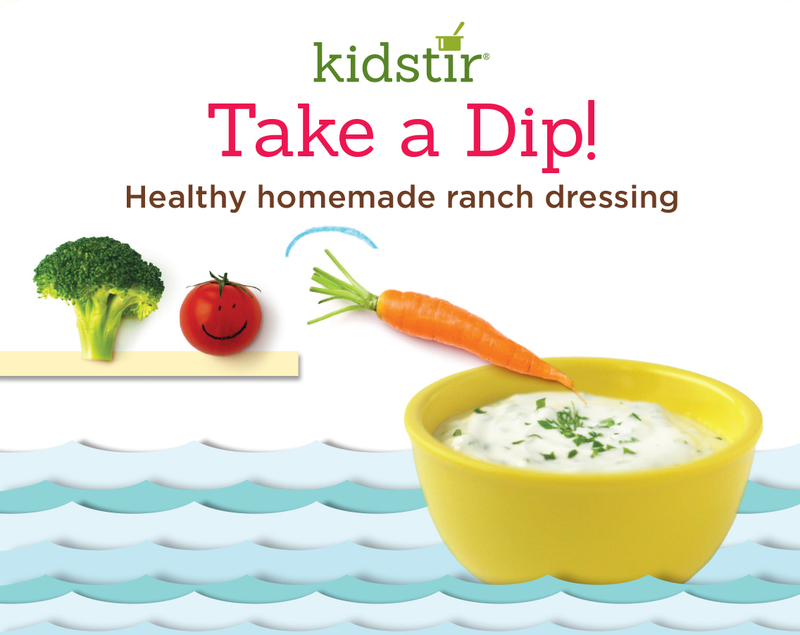 At snack-time, they can take a dip with carrots, celery, and other veggies. 1. Spoon the yogurt into a medium-size bowl. Add the vinegar and milk to the bowl. Stir with a spoon or a small whisk. 2. Snip the parsley and dill with the kitchen scissors. Cut only the leaves — not the stems. Measure 1 tablespoon of each. Stir the herbs into the yogurt dip. 3. Peel the garlic clove. Squeeze the handle over the bowl of yogurt and press out a little garlic. Stir well. You can add more garlic to taste. 4. Add a pinch of salt and a pinch of pepper. Stir it up and give it a taste test. Does it need more salt or pepper? Add a pinch more! 5. Serve the dip with veggies on the side. Then cover the rest of the dip and refrigerate overnight. This will bring the flavors together even more!